On display at Museum of Glass from February 7 to September 21, 2014, Look! See? The Colors and Letters of Jen Elek and Jeremy Bert provides a prime opportunity to explore the material of glass in the broad context of contemporary art. Despite the recent 50th anniversary of the Studio Glass movement, the contemporary art world still regards glass with lingering doubts and suspicions when it comes to the larger arena of contemporary art. It is perhaps because it is still vulnerable to skeptical critiques that it remains a craft-based material. Nevertheless, it is through exhibitions like Look! See? that glass can stake a wider claim on contemporary art and indeed begin to convince even the most resistant gatekeepers that glass, in fact, is in a vanguard position, driving contemporary art forward in unexplored directions. What is contemporary about Look! See?? Perhaps most apparent is the abstract and minimal quality of the work, rather than a focus on the figurative or representational: the glass in the exhibition also steers away from the vessel, although the float is certainly conjured. The channel letters, by their very nature, are signs from an abstract system; they are found objects recontextualized in a museum setting. The bright, primary, playground colors and choice of abstract spheres, ovoids, steel panels, chrome and letters all conjure the world of Pop Art, an art movement of the late 1950s and 1960s which still exerts a powerful influence today. In Pop Art, mass media is often assimilated or co-opted and brought into fine art. In Look! See?, viewers are not just urged to reflect on the presence of ads in the urban environment, but to actively do something about it, engage the glitz and make use of it, reimagine it, even exploit it for their own (artistic) purposes. More on this shortly. 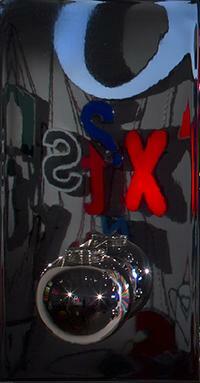 The reflection of words on some of the panel pieces (Believe, 2013; Signal, 2009; both collaborations) is deliberate, just as the reflection of the viewer is also intended to suggest the ways in which language, particularly as delivered by industrial media like street signs, creates a warping or distorting effect that we ordinarily do not notice. Seeing ourselves in this world of letters and glass units, we see ourselves backward as it were, somehow contained in a world that doesn’t really exist, or one that we create in our imagination (which some might argue is therefore real enough. The artists envision the essential act of seeing in Look! See? as a two-part or two-step process wherein the first act is looking, gazing, staring, with the eye attracted by the beauty of the object or by an apparatus designed to create a visual stimulus. The second step involves perception and a sense of awareness that accompanies the physical act: in our reality, it is all too easy to look without seeing. That is why the second word in the exhibition title is a question mark: seeing is not guaranteed. In a world of digital information, the business of reaching consumers with messages about products and services they may or may not want has become highly advanced and sophisticated. 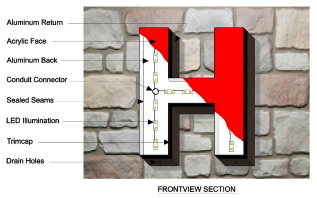 A glance at an industrial sign company, for example, indicates an entire menu of sign components that alternately flash, reflect, move or otherwise capture the human eye. “Electronic Message Centers (EMC’s),” as an industry website explains, “can be a very aggressive way to market specials and events, as well as create a public service tool that will keep eyes tuned in to your sign” (my emphasis). Against this onslaught of more or less unwanted data, art offers a respite, a welcome relief or rest, perhaps even a moment of fun, when the viewer can reestablish control over the barrage of signals. In this sense, the viewer’s participation completes the artwork; he or she acts as a kind of collaborator or co-author of the text. These sorts of viewer-based processes are very much in the contemporary range, as is the whole implicit critique of art’s role in the media jungle. In this reading, Elek and Bert’s exhibition Look! See? becomes far more than a display of beautiful glass and playfully restored letters; it offers us the means to reflect on our postmodern condition and empowers us to act as agents in the scheme of things rather than passively allow media-generated messages to determine the nature of our reality. This entry was posted in Art, Artists, Exhibitions and tagged art, channel letters, contemporary art, craft, Jen Elek, Jeremy Bert, media, Museum of Glass, pop art, Studio Glass Movement on January 27, 2014 by Museum of Glass. Welcome to the Museum of Glass blog! Working in the Curatorial department at Museum of Glass often feels like the museum version of an extreme makeover reality TV show. When we install exhibitions, we typically have 10 business days to completely transform our galleries to tell a new story through paint, lighting, objects and labels. We joke that to visitors, it must seem like elves tiptoe in and convert the galleries overnight. If only! 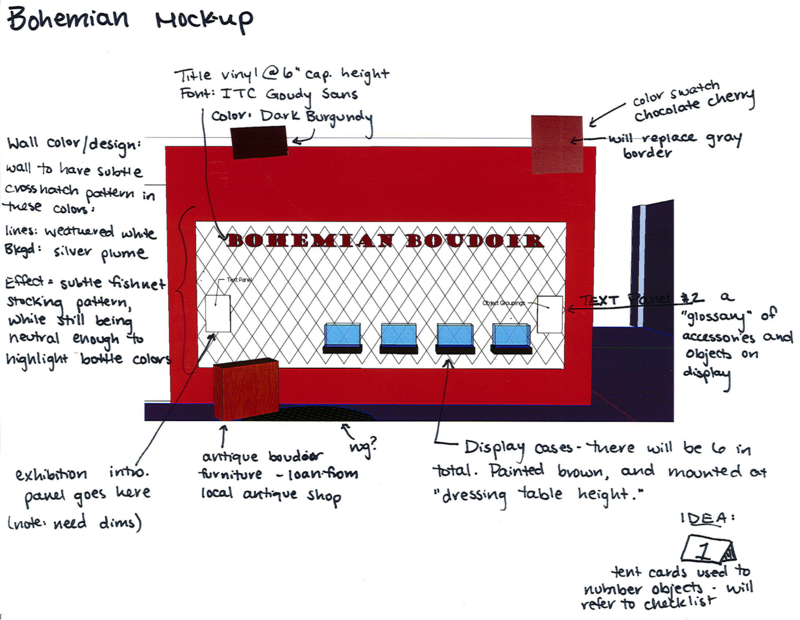 The reality is that changing an exhibition space, even a small one like the wall in our Grand Hall, takes planning. On Monday, January 13 and Tuesday, January 14, while MOG was closed to the public, we installed Bohemian Boudoir, a display of Czechoslovakian perfume bottles from the 1920s and 1930s. Our goal was to make the space feel warm and romantic, accomplished by our burgundy and cream color scheme. 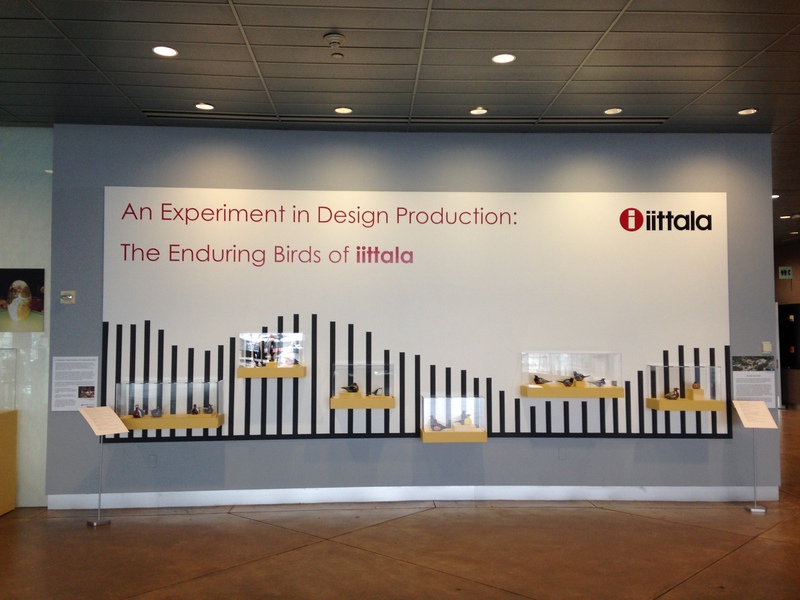 The display cases are the same ones used in An Experiment in Design Production: The Enduring Birds of Iittala, but they have been repainted brown to resemble dressing tables. The goal of all of this planning was a smooth installation. We only had 20 hours total, and a team of 2-3 people to accomplish this Extreme MOG Makeover. 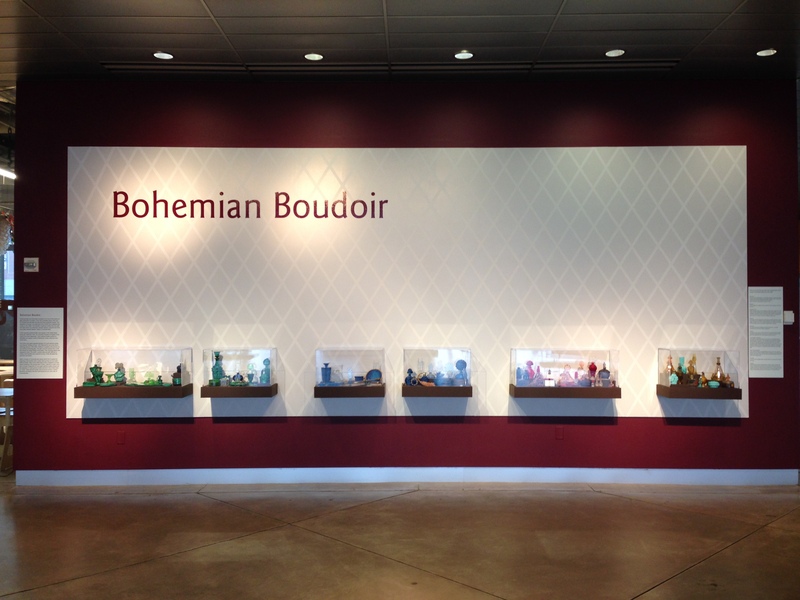 Now that we have unveiled the finished product, stop by to see our exhibition Bohemian Boudoir. This entry was posted in Art, Exhibitions, Installations, Museums and tagged art, Bohemian Boudoir, exhibitions, Iittala, installation, Museum of Glass on January 20, 2014 by Museum of Glass.